As regular readers may know, I’ve been involved with the Milwaukee Makerspace for some time now, and being a member has given me access to tools and equipment I’d never have on my own, but more importantly it’s given me access to a community of makers who have assisted me with projects, some personal, and some business-related. I wouldn’t be selling products right now if it weren’t for the advice of Milwaukee Makerspace members. 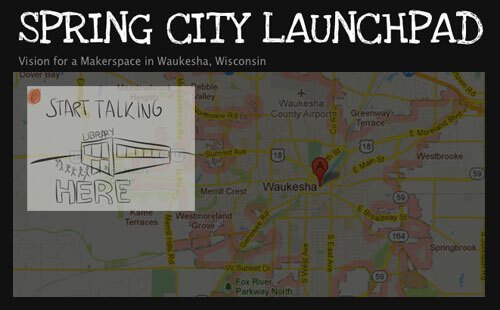 So while Milwaukee is fairly close to Waukesha, it’s certainly not in Waukesha, and I’m excited to learn that there are some makers & hackers in Waukesha working towards a new group/space called Spring City Launchpad. Spring City Launchpad hopes to assemble a group of interested people: makers, artists, creatives, builders, etc. and create a collaborative workspace where people can share skills, tools, and knowledge. Will it be exactly like Milwaukee Makerspace? No. It also won’t be exactly like Sector67 in Madison, or PumpingStation: One in Chicago. Each space evolves into what it is based on the members and the interests and activities of the members. If you’ve got an interest in seeing a new creative space in Waukesha, you can sign up on the Atrium site, and if that’s not enough, join us on Saturday, May 12th, 1:00pm-2:30pm at the Waukesha Public Library, 321 Wisconsin Avenue in Waukesha. Posted on Saturday, May 5th, 2012 at 8:00 am. Subscribe to the comments feed. Both comments and pings are currently closed. Post on your own blog.